I quite like Fantasy Flight Games' Twilight Imperium, 3rd edition. It's not perfect though. The rules for the base game include one of the worst tech trees in existence. The Shattered Empire rules maintain the same style with the same problems, while actually making them worse by trying to shoehorn the new technologies into a structure not intended to support them. Fantasy Flight has given up completely with the Shards of the Throne rules which don't include a tech tree at all. remain compact with short unambiguous connections between technologies. Clearly, not all these goals can be satisfied simultaneously. 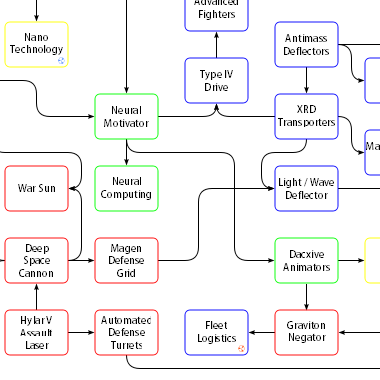 I want a tech tree that is useful for answering the question: "This tech is pretty cool; what do I need to get that?" These tech trees forego a left-to-right progression in terms of the number of prerequisite technologies in favor of short, clear, non-crossing lines illustrating the relationship between technologies. Multiple arrows pointing to a technology indicate a logical OR: at least one of the prerequisites must be satisfied to unlock the given technology. Multiple lines which join into a single arrow at a particular technology indicate a logical AND: all of the prerequisites must be satisfied. It's axiomatic that one can't please all the people all of the time, so I'm trying to please &frac18; of the people all the time, with eight different tech trees. There are shaded and outline-only tech trees, a titles-only version that fits on half an 8½ x 11 inch page and a full-page version that includes descriptions of each technology, either with or without badges indicating which technologies come from which of the two expansions. In order to keep the number of permutations to a just barely sane number, I've decided not to draw a tree for the base game. The Assault Cannon tech in the base game requires Deep Space Cannon whereas the revised version which shipped with Shattered Empire requires Automated Defense Turrets instead. The Advanced Fighters and Micro Technology techs were also modified slightly in the expansions, but their positions within the tree have not changed. These tech trees are licensed under a Creative Commons Attribution 3.0 Unported license. You are free to use or modify this work, for commercial or non-commercial purposes, provided that you attribute the original to Ben Davenport or link to the file's original location at http://www.monkeysushi.net/gaming/TI3/.